This product contains full area coverage ReS2 monolayers on c-cut sapphire substrates. Sample size measures 1cm in size and the entire sample surface contains monolayer thick ReS2 sheet. Synthesized full area coverage monolayer ReS2 is highly crystalline, some regions also display significant crystalline anisotropy. 1) Identification. Full coverage 100% monolayer ReS2 uniformly covered across c-cut sapphire. 2) Physical dimensions. One centimeter in size. Larger sizes up to 2-inch wafer-scale available upon requests. 3) Smoothness. Atomically smooth surface with roughness < 0.2 nm. 4) Uniformity. Highly uniform surface morphology. 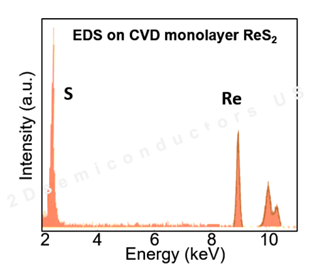 ReS2 monolayers uniformly cover across the sample. 7) Crystallinity. High crystalline quality, Raman response, and photoluminescence emission comparable to single crystalline monolayer flakes. 8) Substrate. c-cut Sapphire but our research and development team can transfer ReS2 monolayers onto variety of substrates including PET, quartz, and SiO2/Si without significant compromisation of material quality. 9) Defect profile. 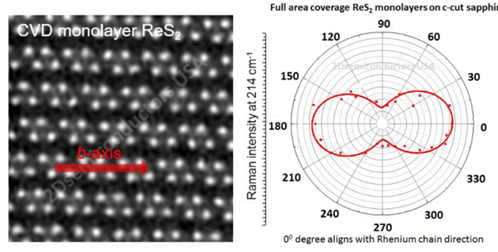 ReS2 monolayers do not contain intentional dopants or defects. However, our technical staff can produce defected ReS2 using α-bombardment technique. 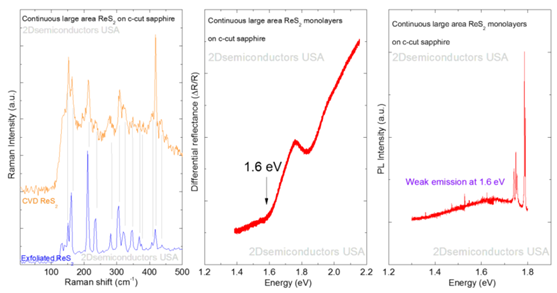 Transmission electron images (TEM) and angle resolved Raman spectroscopy measurements acquired from CVD grown full area coverage ReS2 monolayers on c-cut sapphire confirming crystalline anisotropy. Raman spectroscopy measurement confirm monolayer nature of the CVD grown samples. Differential reflectance measurements clearly show band gap at 1.6 eV for ReS2 consistent with the existing literature values. PL spectrum only display weak emission at 1.6 eV but significantly stronger at lower temperatures.